Don’t Miss These Acts on the Armstrong Theater Stage! The 2nd annual South Bay Festival of the Arts on June 23, 2018, will feature over 15 musical acts on three different stages. Here is a sneak peek of the acts on the Armstrong Theater Stage. Click here to download the complete show and workshop schedule! The Pacific Symphony Youth Orchestra (PSYO) was founded in 1993 by the Pacific Symphony’s music director, Carl St. Clair. The PSYO represents 29 schools in and around Orange County and offers educational and performance opportunities for musicians in grades 9-12. These young musical prodigies rehearse every weekend and perform a three-concert series every symphony season. LA-based singer and songwriter, Sylvia Bosco, first picked up her acoustic guitar at the tender age of 12 – which, by the way, was just four years ago! Since then she’s had a lot of success, even earning a coveted spot in the PRG/Acoustically Speaking Concert Series as a resident performer! Sylvia is bringing her soul-folk style to the stage to wow South Bay audiences. Second place winner in the 2016 South Bay’s Got Talent competition, Liz King, will light up the stage with her sultry voice and impressive guitar playing. Non-profit theatre company, Encore South Bay, is more than just a theater company – they’re mentors and community leaders, too. They take their mission to “create leaders through arts education and mentorship programs” very seriously, even as they encourage their performers to be themselves and explore their own unique creativity. Asano Taiko US, one of Japan’s leading manufacturers of taiko drums (for over 400 years!) is home to taiko performing ensemble UnitOne. 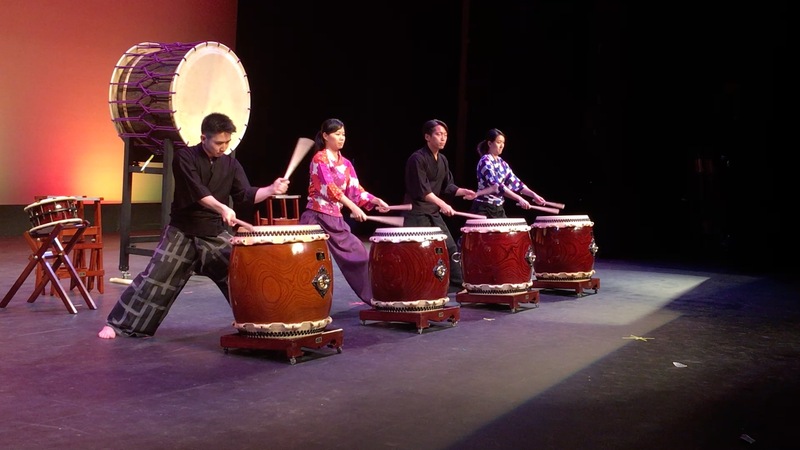 The ensemble has performed in both the United States and Japan and features some of the most exciting world-class taiko performers in North America! Francesca Stern, founder and owner of Dance 1, strives to provide a positive, supportive learning environment for everyone who dances through her doors. All dancers who take classes receive a high-level of training – no matter if they are interested in dancing for recreational purposes, getting into shape, or for a professional career. Also home to the Redondo Ballet and a performing company, Dance 1 performers always put on an amazing show! Singer/songwriter Jessica Lombardozzi is one half of the alt-pop/indietronica duo LACEI, along with musician Viktor Ahlgren. Jessica’s haunting lyrics and sultry voice are an autobiographical journey that showcase her talent and vulnerability, painting her as part rebel, part escapist. Sufferer by Lacei on VEVO. The Aerospace Players was originally created to provide a place for the members and family members of the Aerospace Corporation and the Air Force to engage in “lively arts.” Now, decades later, the Aerospace Players (or TAP) stage two productions a year with a live orchestra and professional-level performers. The South Bay Festival of the Arts is FREE for everyone to attend! It’s an all-day event featuring fine foods, craft beer, local artisans, and top-notch performers. Register today to let us know you’re coming! 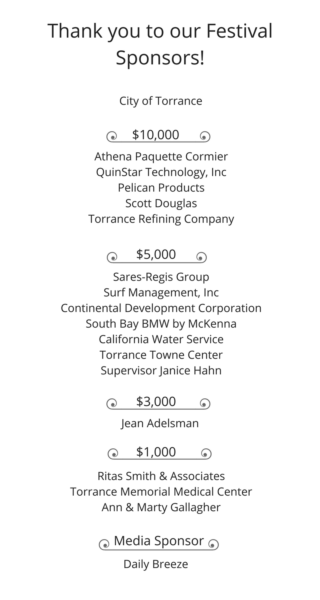 Get your free tickets to the South Bay Festival of the Arts by clicking here!